LAS VEGAS, NV — Over at the Cosmopolitan Hotel, the Timothy Bradley-Diego Chaves press conference had the most important photos ops of the week. No, it wasn’t the fighters themselves. 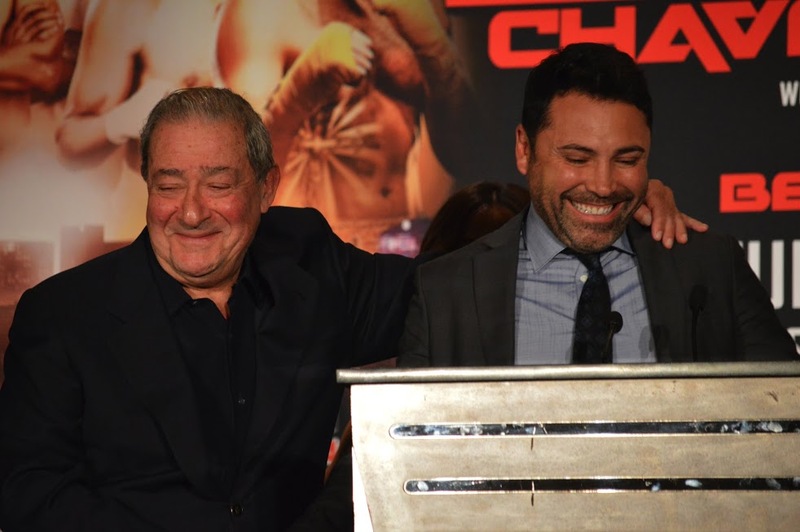 The importance came from seeing rival promoters Bob Arum and Oscar De La Hoya all smiles and hugs. Yes, both have said for weeks that the Cold War is over, but yesterday was the first time we’ve seen the former friends turned enemies turned friends again showing public solidarity. Despite Top Rank (HBO) and Golden Boy (Showtime) holding rival cards on Saturday, there is still come co-promotional work being done with GB fighter Mauricio Herrera fighting Top Rank’s Jose Benavidez on the HBO card. Let’s hope this is an indicator of things to come. Also fighting on the card will be Matt Korobov taking on Andy Lee.